Johnny Johnson's obituary photo. The checkered tie is quite appropriate. 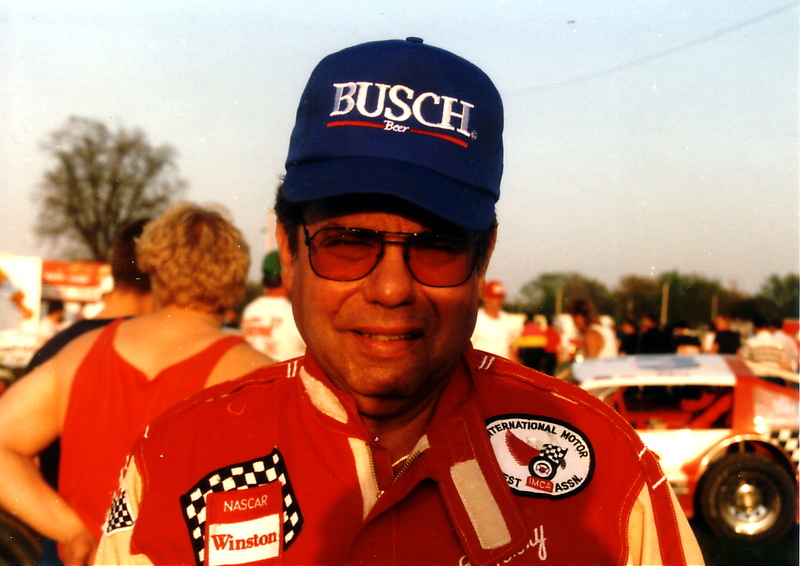 Johnny is pictured early in the 1992 season at a NASCAR Busch All-Star Series race at Davenport (Iowa) Speedway. Phil Roberts photo. Johnny was a major player in Midwest (and beyond) dirt track stock car racing for a lot of years. How many people can say they successfully drove a Late Model race car, sponsored race cars and racing series, sold race cars and parts and owned a race track and promoted races — all while running some other businesses? I have many memories of Johnny. I announced many races, mainly in eastern Iowa, that Johnny and his black no. 99 were in. I also watched him compete and worked with him when I was the media coordinator (1990-2001) with NASCAR’s Busch All-Star Series races. I was announcing in West Liberty in the 1980s when there was a head-on collision on the straightaway that hurt both Johnny and the other driver. I was an EMT at the time. When I noticed that all of the attention was being focused on the other driver, the most seriously injured, and none on Johnny, I put down the microphone and treated Johnny for what appeared to be a broken ankle until more help arrived. A decade or so later, I met with him in his office, interviewed him and photographed him for a profile story in NASCAR News. It was a pleasure knowing Johnny and his family and crew. He was an important part of racing in the Midwest. BURLINGTON, Iowa — John R. “Johnny” Johnson, 75, of Burlington, Iowa, died Saturday, February 19, 2011, in West Des Moines, Iowa. Johnny was born October 15, 1935, in Burlington, Iowa, to Millard and Ethel (Blake) Johnson. He was the oldest of four sons and graduated from Morning Sun Community High School. Following graduation Johnny began his career in farming. In 1967 Johnny started his own business, J&J Steel, specializing in steel erection. In 1983 he acquired Ideal Ready Mix Inc. Johnny owned and operated 34 Raceways until 2006. 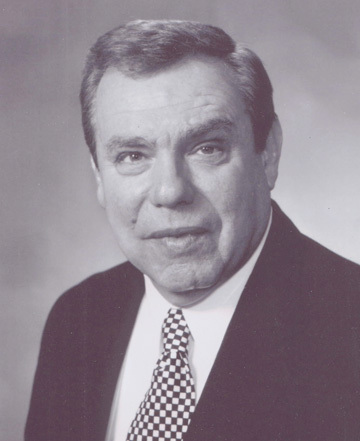 In addition to serving as CEO and owner of J&J Steel and Ideal Ready Mix, Johnny also owned and operated L&W Quarries and JRJ Enterprises. Johnny was active in Late Model car series racing for over 30 years. Driving the car numbered 99 was his hobby and passion. He was elected to the National Late Model Hall of Fame, Des Moines County Cattleman’s Association 2008 Associate of the Year and 2007 Honorary Des Moines County 4-H member. During his career he served as Board Member of Southeast Iowa Builders Association, President and Board Member of Iowa Ready Mix Concrete Association, Board Member of Burlington/West Burlington Chamber of Commerce, Board Member of Grow Greater Burlington, Board Member of Burlington Bank & Trust (currently Two Rivers Bank & Trust), Board Member of Great River Financial Group and Board Member of Iowa Limestone Producers Association and was a past member of the International Association of Bridge Structural and Ornamental Ironworkers Local #577. Survivors include four children, Wayne W. Johnson of West Burlington, J. Scott Johnson and his wife Julia of Clive, Iowa, Cristy L. (Johnson) Schmidt and her husband Michael Schmidt of Burlington, and Jay B. Johnson and his wife Mindy of West Burlington; five grandchildren, Nathan K. Schmidt, Jaclyn K. Johnson, Ross D. Johnson, Graham R. Johnson and Jamie L. Johnson; two brothers, James L. Johnson and his wife Terry of Wapello and Mickey M. Johnson and his wife Sandra of Wapello; and a sister-in-law, Mary Beth Johnson of Madison, Wisconsin. Mr. Johnson was preceded in death by his parents and his brother, Keith Johnson. A private family service will be held Saturday, February 26, 2011, at 10 a.m. at Immanuel Lutheran Church in Mediapolis, Iowa, with Rev. Jerleen Schlesser officiating. Burial will be in Kossuth Cemetery. A Celebration of Johnny’s life will be held on Saturday, February 26, 2011, at the Burlington Golf Club. The family invites Johnny’s friends and fans to join them at the Burlington Golf Club from noon to 3 p.m. Special remembrances will be shared at 1 p.m. The family requests that in lieu of flowers donations be made to the John R. Johnson Memorial for Southeast Iowa Builders Association Scholarships. Memorials may be sent to P.O. Box 1113, Burlington, IA 52601. The Hagele and Honts Funeral Home in Morning Sun is providing the care and arrangements for the Johnny Johnson family. I had known Johnny mostly from a business relationship. There were times when I wanted to learn more about the art of dirt track racing so I went to Johnny. Johnny asked me one time, “Have you ever been on a dirt track”. I had not so he took time out of his day to take me to 34 Raceway for a spin in his Caddy. It was neat to experience it and the only time I have ever been on an oval dirt track. Johnny talked about Daytona often. Whenever I watch the race I always think about Johnny down at the race and the week before hand. How he must have had the time of his life rubbing shoulders with all of those guys who were so involved with the racing circuit. Johnny always was up front and straightforward with me and I preferred that approach. I think more than once I witnessed his compassion for tough situations. He was a business man for sure and he enjoyed the heck out of his sport ! !